Apple are often eaten raw. The whole fruit including the skin is suitable for human consumption except for the seeds, which are slightly poisonous. The core is often not eaten and is discarded. Varieties bred for raw consumption are termed dessert or table apples. Apples can be canned or juiced. Apples are an important ingredient in many desserts, such as apple pie, apple crumble, apple crisp and apple cake. They are often eaten baked or stewed, and they can also be dried and eaten or reconstituted (soaked in water, alcohol or some other liquid) for later use. Puréed apples are generally known as apple sauce. Apples are also made into apple butter and apple jelly. 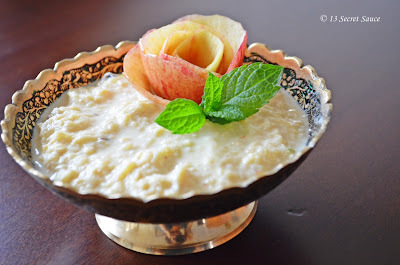 Today we are trying to make an Indian delicacy rabri with apple flavour in it. 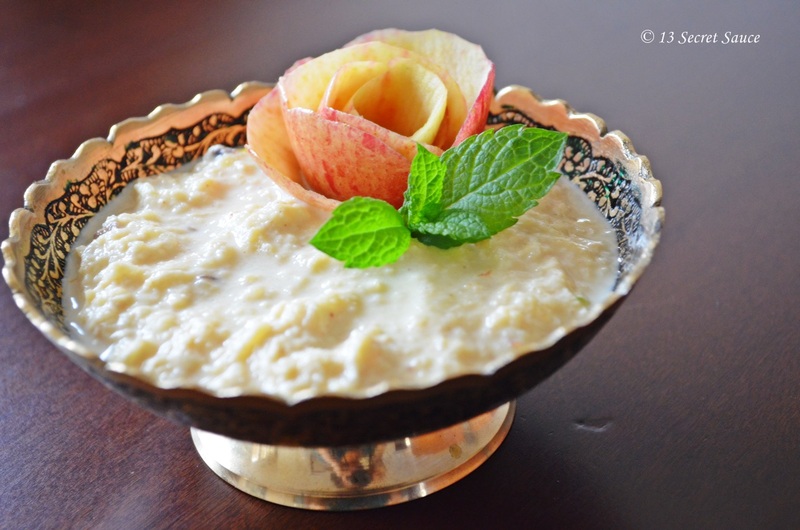 Sweet Rabri is a sweet, condensed milk based dish made by boiling the milk on low heat for a long time until it becomes dense and changes its color to pinkish. Sugar, spices and nuts are added to it to give it flavor. 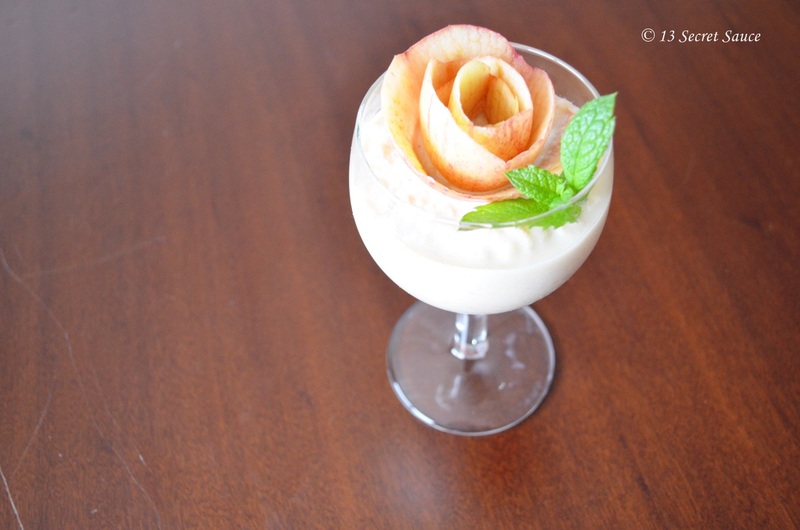 It is chilled and served as dessert. This recipe can be made in advance and used for any lunch or dinner party. 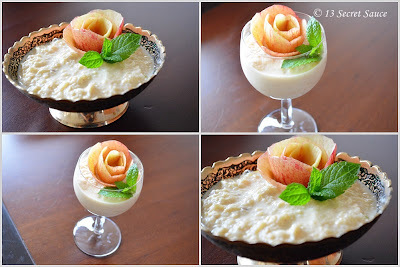 Apple Rabri can also be used in fasting. 1) Pour milk in a broad vessel and bring to a boil. Simmer till reduced to half the original quantity. 2) Add sugar and cook on low heat, stirring continuously. Add cardamom & cinnamon powder. 3) Add the grated apples to reduced milk and mix. Cook for three to four minutes. 4) Add almonds and pistachios. Pour into a serving dish. 5) Apple Rabri is ready. Serve hot or cold. Chandrakala is an extension of a very famous recipe call gujiya specially made on Holi a festival of colors. This recipe is prepared with Koya and dry nuts filling in a maida puri, fried and then dipped in sugar syrup. To make this extraordinary sweet you need loads of patience and few ingredients. Let's get cooking. 1) Mix maida and ghee in a big bowl rubbing it with your palm. Knead the flour into stiff dough using warm water. 2) Cover the dough with wet kitchen towel and set aside for 30 minutes. 4) Finely chop or grind roughly all the dry nuts. Add it to the khoya. Add raisins, cardamom powder, 1/2 cup sugar Mix well. 5) Now divide the dough in 30 equal parts. Roll in small rounds or about 2.5-3 inches diameter like a small puri. Work covering the dough or puri with a damp towel else the dough will become hard. 6) Divide the filling in 15 equal parts. Place on round puri on a clean working table; add the stuffing in the center using a small spoon. 7) Using your finger apply some water around the edge and place another puri just above the 1st one. 8) Stick the edges by pressing up with your finger and close the stuffing in between two puris. 9) Now put this stuffed chandrakala in your one hand and start making pattern along the edge. To make the pattern first press with the other hand and then twist, now press again and then twist. Repeat the process for the complete edge around the circle. Set aside and cover with damp cloth. 10) Similarly make all the chandrakala and set aside. 11) Heat some oil in a khadai at medium flame. Oil should not be too hot. 12) Fry all the chandrakala till golden brown and crisp at the medium flame. It takes around 7-8 minutes to fry one set of chandrakala. Let it cool completely. 13) Add 3/4 cup water in 2 cups of sugar and cook to make syrup, add few saffron strands. Make 2 string sugar syrup by cooking 5-7 minutes after sugar dissolves. 14) Toss each chandrakala one at a time in the sugar syrup carefully. 15) Keep it on tray and let it dry. Use chandi key wark to decorate the top of chandrakala. 16) Serve at room temperature and make your festival special.